Our friends from Alice Springs, the Yungbul Mob with Tyson and Eddie, stayed with us at the College for 9 days late this term, in their third visit to the College. While here they joined members of our community – staff, students, parents and Old Boys – at various events from surfing lessons to a school dance and justice work in the community. They took part in various classes including Science, Music, French, Art, Sport and TAS, and they shared many a meal with us including a very successful farewell dinner and reflection. 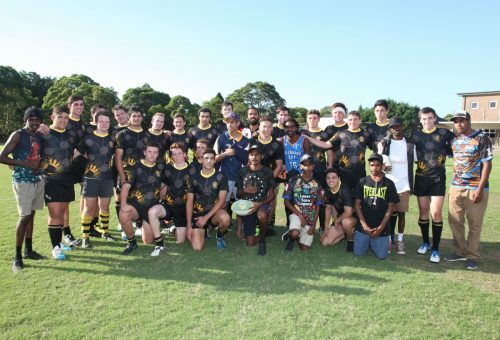 The visit culminated in their presence at and involvement in our Reconciliation Round of Sport against Sydney Grammar, as they presented the First XI Football and First XV Rugby with their Aboriginal jerseys and stood with us for Acknowledgement of Country. We look forward to our return visit to Alice Springs in September and to continuing the conversation and friendship that was so strongly forged these past couple of weeks. We will miss them.